2002 : Ailleurs Records : Marc Morgan : Remix it ! : online remix contest : webdesign and art direction. "Remix it !" was an online remix contest based on 17 cuts from the "Discordance" original session. For a total of 26 remixes and 1 videoclip submitted, 10 of them were chosen by Marc Morgan and Rudy Léonet, presenter and producer of "5 heures" broadcast show on Radio 21 (now called Pure FM). "Discordance [Remiksss]" by winner Sylvain Garçon was broadcasted in a "5 heures" special sequence, july 17, 2002. Some other remixes were further selected in "Sacré Français" broadcast programme by Alexandra Vassen. but first here is the full list of participants. Thanks to you all ! 01. Remiksss by Sylvain Garçon. 02. I Hate Variety Mix by Variety Lab. 03. Radio Koda Remix by Koda. 04. Amoremix Remix by The Helmut Grandjean Orchestra. 05. 404 Remix by Super Raider. 06. Poxfil Mix by Laurent Sparrow. 07. Betaversion Mix by Le règlement d'ordre intérieur. 08. Strange Mix by Bruno Balthazar. 09. Kolargonic Mix by Dominique Baillot. 10. Tchip Sound Mix by Marc Gilboux. 11. Mixordance by Patrick Schouters. 12. Raf Mix by Raphaël Piras. 13. Dark-o-dance Mix by Julien Toussaint. 14. MerryMix 01 by Laurent Mairy. 15. Discordance Dub Mix by Mr Leroy and his Loop Orchestra. 16. MerryMix 02 by Laurent Mairy. 17. 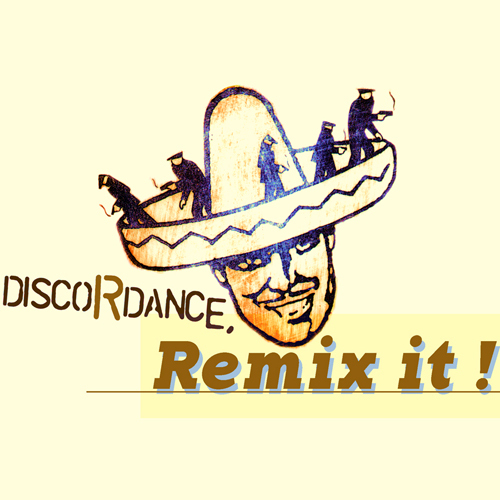 Discordance Radio Edit Remix by Mr Leroy and his Loop Orchestra. 18. MdM's Remix by MdM. 19. Fred Mix by Frédéric Thiel. 20. Alain Mix by Alain M.
21. Dirty Pop Mix by J-F.
22. Crash Remix by North Project. 23. Tico Remix by Emmanuel Degols. 24. Acoustic Mix by Bastien Reul. 25. Charlotte Discordance Remix by Charlotte Maison. 26. Morgan Frud Mix by Rudy Rixhon. ... And a very special mention for ineligible but amazing "Brasier Video Remix!" by La Gaillarde Broadcast Inc.
(All instruments and sequences by Marc Wathieu). Download here the 17 tracks pack (zipped - 19,5 Mo). .mp3 - 320 Kbps - 6,6 Mo. .mp3 - 320 Kbps - 9,6 Mo. .mp3 - 320 Kbps - 7,9 Mo. .mp3 - 320 Kbps - 11,1 Mo. .mp3 - 320 Kbps - 10,8 Mo. .mp3 - 320 Kbps - 9,1 Mo. .mp3 - 320 Kbps - 7,4 Mo. .mp3 - 320 Kbps - 8,2 Mo. .mp3 - 320 Kbps - 5,7 Mo.